Jerry begins talking about his tan cotton dockers and how much he hates the commercial. When Donna says that she kinda likes the commercial because the dialog rings true for her, Jerry is perplexed and tells all of his friends. Donna gets upset with Jerry when Kramer and George both meet her and mention that she likes the commercial. Jerry: Come on, try it. Let me hear you try a Scottish accent. Jerry: Irish, Scottish, what’s the difference, lassie? Donna: I’d invite you up, but the place is being painted. Jerry: OK, but there’s no cake or anything, if that’s what you’re looking for. Jerry: I think if one’s going to kill oneself, the least you could do is leave a note – it’s common courtesy. I don’t know, that’s just the way I was brought up. Jerry: Oh, so important. So what are you doing Thursday night – you wanna have dinner? Jerry: Tan pants. Why do I buy tan pants, Donna? I don’t feel comfortable in them. Jerry: Oh, I can’t begin to tell you how much I hate that commercial. Donna: Yeah, that’s the one. Donna: I don’t know, I like the guys. 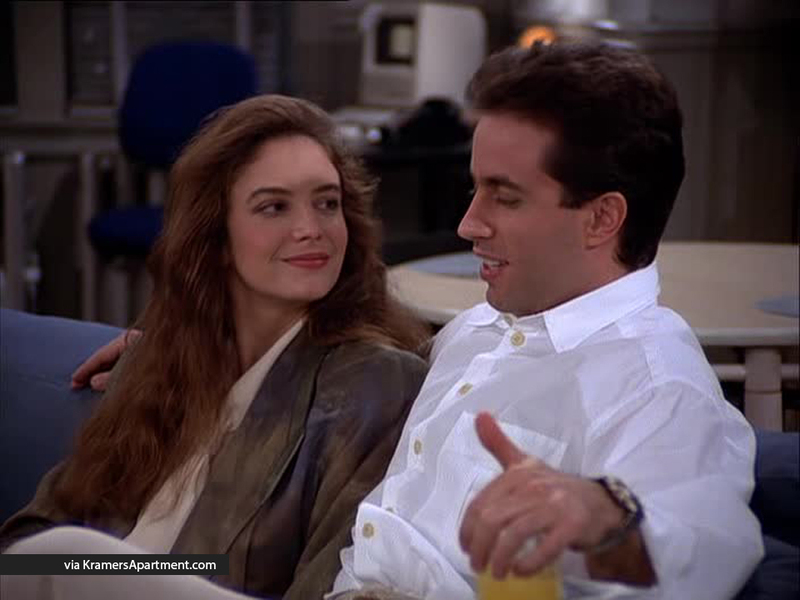 Jerry: Yeah, they’re so funny and so comfortable with each other, and I could be comfortable too, if I had pants like that. I could sit on a porch and wrestle around, and maybe even be part of a real bull session. Jerry: Even if the dialogue did ring true. Even if somehow somewhere men actually talk like that, what does that have to do with the pants? Doesn’t that bother you? Donna: That’s the idea. That’s what’s clever about it, that they’re not talking about the pants. Jerry: But they’re talking about nothing. pants, pants, pants, pants, pants. What is that supposed to be? Jerry: I have never seen one episode of ‘I Love Lucy’ in my life ever. Jerry: Yes, I’m lactose intolerant. Jerry: I have no patience for lactose. And I won’t stand for it. Donna: Wait, wait. He’s in the bathroom. George: I just wanted to talk to him for a minute, but I’ll come back. Donna: You don’t have to leave. George: Donna. Oh, you’re the one that likes that commercial! Donna: So you go around telling your friends I’m not hip because I like that commercial. George: Say? What? Nothing, I..
Donna: Well, so, you didn’t have to tell your friends. Jerry: No, I had to tell my friends, my friends didn’t have to tell you. Donna: I don’t like you talking about me with your friends behind my back. Jerry: I said I couldn’t believe you liked that commercial. So what? Donna: Don’t bother, I’m leaving. Jerry: Donna, really, you’re making too much of this. Kramer: One hundred percent Cotton Dockers, if they’re not Dockers, they’re just pants! George: I can’t believe I said that. You know me, I’m a vault. Jerry: Don’t worry about it, it wasn’t working anyway.